Your first step is to use the Veterans Online Application System called VONAPP. Once you complete your application online and select your school the information is sent to your location VA office. Getting a college education is one of the most common goals among people. New research shows that most of the 45% of the Americans who dropped out of college or vocational school in 2008 did so because of the economical crisis. The results also showed that half of the Americans who drop out of college or vocational school will return to school one day, while the other half won’t be financially able to. The main reason for their lack of finances for school is lack of information. Most aren’t aware that family members of either an active duty member of the military, a member of one of the U.S. Armed Forces Reserves, or a military veteran can get financial aid for education for themselves and their dependants? The truth is that a good education is expensive and the price only continues to rise. Currently there are many options of grants, financial aid, and assistance programs that you and your dependants can combine to avoid dropping out of school and continue studying. 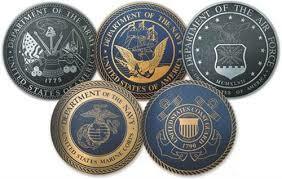 The main financial assistance program for those who serve their country and for their family members is the GI Bill. This program provides financial assistance for education programs such as college degrees, certificates, or credentials in any field. The program was created in 1944 and is the most common form of educational aid among active members who want to continue with their education in a college or university. The GI Bill can also be used to pay for vocational training, technical training and job placement. The GI Bill covers more than 36 months of education. You can get in average $1,034 per month if you were active at least for 2 years. These rates are different for each active member depending on the time of service and some other parameters. Another program offering financial assistance to members of the military is the tuition assistance (TA) program. It is a program that gives tuition for people who are attending school and have problems with some lessons. Or simply wants to become more skillful in the class. The Department of Veteran Affairs has a program for spouses and family member that provides grants to attend colleges and universities and get a degree, certificate, or credentials in any field valid in the country. In order to be eligible for any of the afore mentioned programs or financial aid resources for you or your family members you need do need to meet some requirements, deadlines, and you’ll need to provide documentation. For example to get the GI Bill you need to be active in the military for a required period of time - in any division of the US Military. This includes: Navy, Army, Air force, Marines, or National Guard. Also, there are many forms of the GI BILL, so be sure to apply for the one you are most likely to qualify for. It’s highly recommended that before you apply for any grant, scholarship or financial aid you check with your Education Service Office for your division to find out about the exact requirements and the steps you’ll need to take to apply. They are well-trained and they can give you good advice about the quickest and best way for you to apply and get the money your service to your country has entitled you to.